A Carer is someone who voluntarily looks after a friend, relative or physically/mentally disabled child who needs support to live at home. Carers come from all age ranges and are not always women. Some Carers may already be known to the practice, but many still need to be identified. Please let us know if you are or have a Carer. Carers Information – 0800 028 0287 available every weekday 9.30am–4.30pm advice on rights/practical help supported by Lanarkshire Carers Centre, North Lanarkshire Council and Carers Together. 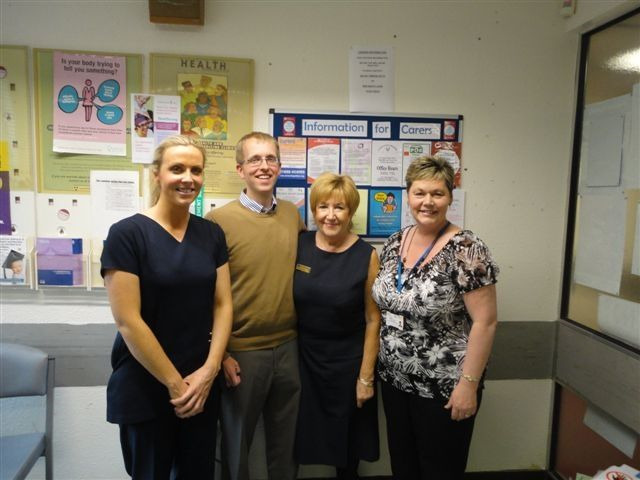 (Picture above) Wellwynd Practice Dr Ian McHardy Nurse Debbie Timmons Boyd Mrs Marta Laird and Mrs Yvonne Cameron Co-ordinator for Carers Together. This picture is an example of good partnership working with our Practice team and Carers Together. This picture has been published in a Carers Together Newsletter.